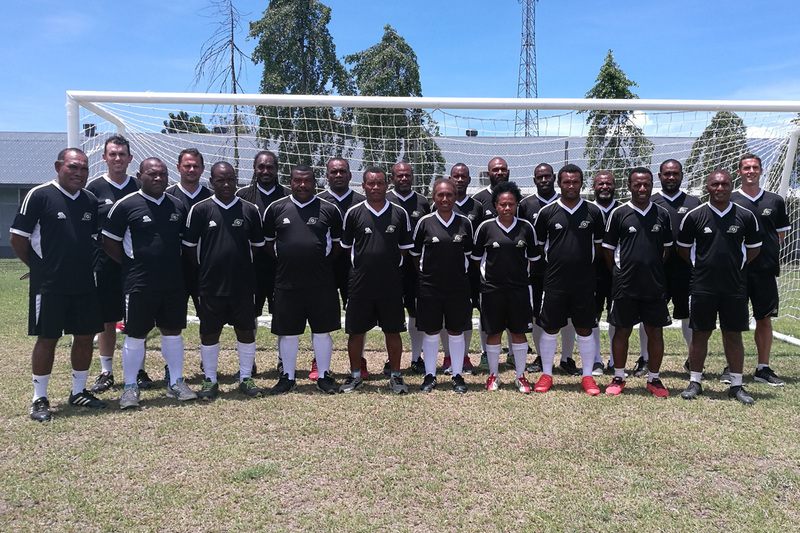 The first ever Member Association-focused OFC Senior B Licence course was held in Solomon Islands last week. After displaying their wealth of raw talent in regional competitions throughout 2017, Solomon Islands Football Federation has taken the next step in its long-term development by putting the spotlight on coaching and embracing the first ever Member Association-focused OFC Senior B Licence. OFC Head of Education and Training Giovani Fernandes – who travelled to Solomon Islands to deliver the course from 27 October to 3 November – was impressed with the participants’ positive response to the tailor-made content. “The course is the first OFC-led Senior B Licence conducted in a Member Association catering specifically for the local football community. Previous courses, like that held in Fiji, have all been regional in their focus,” he said. “We were able to incorporate the local context in almost all the course work. For the game understanding part of the course for example, we analysed matches of the Solomon Islands national team and S-League teams. The course aimed to build upon the OFC Senior C Licence qualification with an emphasis on the practical and theoretical aspects of senior level coaching within the modern football context. By delivering the content in-country and using local scenarios as supporting examples, coaches from different levels and backgrounds, including former national team players, were more enthusiastic to learn and share throughout the course which contributed to a richer and more enjoyable learning experience for the participants. “We had a mixture of coaches – some from national teams, others from S-League and some from provincial leagues – all sharing their experiences. We also had former international players such as Batram Suri and Commins Menapi who brought a wealth of knowledge and experience,” Fernandes said. Although Fernandes knows the OFC Senior B Licence is a challenging undertaking, he is feeling confident in the potential of the participants after witnessing their enthusiasm in part one and hopes to see them all continue the process when he returns for part two next year. “The coaches’ contribution and commitment during the course was second to none, however the OFC Senior B Licence is a lengthy process and the work must continue after the conclusion of part one. With SIFF Technical Director Felipe Vega-Arango providing leadership and support, Fernandes is feeling confident about the future development of the participants and football in the Melanesian archipelago as a whole. “Felipe brings great deal of experience from his work with La Liga and it has been hugely beneficial for all to have Felipe join the team of instructors on the course,” he said.